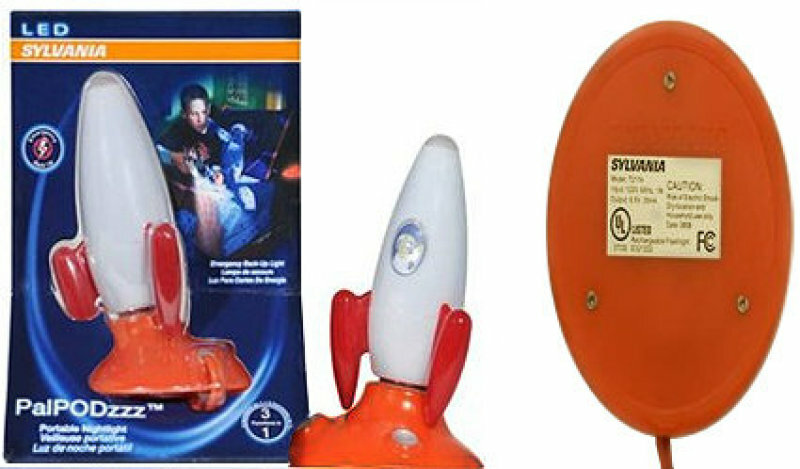 OSRAM SYLVANIA is voluntarily recalling the LED Rocketship PalPODzzz™ Flashlight/Nightlight/Emergency Light (Model No. 72174) due to a safety hazard. OSRAM SYLVANIA is voluntarily recalling the LED Rocketship PalPODzzz™ Flashlight/Nightlight/Emergency Light (Model No. 72174) due to a safety hazard. The bottom plastic cover on the LED Rocketship PalPODzzz™ tabletop recharging unit can break off exposing internal components that can cause an electrical shock if touched. Please stop using this product immediately. Only those products with the date code “0808” and “0908” (printed on the label attached to the back cover) are subject to this recall. No other PalPODzzz™ products are affected by this recall. Immediately stop using this product. Do not return this product to this store. Contact OSRAM SYLVANIA to request a PalPODzzz™ replacement. For more information, call OSRAM SYLVANIA toll-free at 1-877-423-3772 or e-mail us at alerts@sylvania.com. At OSRAM SYLVANIA, your safety is important to us. We apologize for any inconvenience this voluntary recall may cause.